Everything you need to know about air, ground and water source heat pumps. The term ‘Heat Pumps‘ refers to a group of technologies that incorporate HVAC (heating, ventilation, and air conditioning) devices that provide heat energy that is transferred from a source of heat or warmth, to a destination called a heat sink, effectively ‘pumping‘ warmth from one place to another. Heat pumps move thermal energy in the opposite direction of spontaneous heat flow by absorbing heat from a cold space and releasing it to a warmer one. Their primary function is space heating through radiators, underfloor heating systems, or warm air convectors, they can also be used to heat water for use in your home or business. Most heating pumps have fantastic climate control capabilities and can be used to provide space cooling by simply reversing the process of space heating. An air source heat pump for example will extract heat from air outside your property in the same way a fridge extracts heat from its inside and a ground source heat pump functions similarly, but it functions by taking the residual warmth from the soil or a water body outside your property and moves it inside. Although air source heat pumps become less efficient the cooler it is outside, they can be capable of operating sufficiently in temperatures of -15 C, which is 99.99% of the year here in the UK. They have fantastic energy efficiency ratings and although they do have some impact on the environment (as they require electricity to run), they do not combust fuels directly, so in most cases they provide a fantastic way of lowering your carbon footprint. They were mentioned in various literature as early as the 19th century. Lord Kelvin predicted their use in his second thermodynamic sentence. The sentence indicates that if heat can’t pass from a colder body to a warmer one by itself, we must be able to help it somehow. It is the heat pump that solved this problem. In the 1940’s Robert Webber established during his experiments with cooling that the freezing device condenser used by his freezer heats up considerably. Adapting the devices principal function he was able to build the first direct exchange heat pump. By 2004 there were over a million units installed worldwide, providing 12 GigaWatts of thermal energy. Each year over well over 100,000 units are installed. Read more here…. To put it simply, a heat pump is a device that uses a small amount of energy to move heat from one location to another. Heating pumps typically pull heat out of the air or ground to heat space within a property but they can be reversed to cool a property as well. A heat pump doesn’t burn fuel it simply moves heat from one place to another. An air source heat pump for example will take heat from the air outside and pump it inside through refrigerant filled coils, very similar to the ones on the back of your fridge. Due to the wonders of modern technology this process can sufficiently warm your house even in outside temperatures of -15C, with complete interior climate control. This section tells you all about how heat pump systems work. Read more here…. There are many different types of heat pump but they all operate on the same principle, heat transfer. The most common type of heat pump is the air-source heat pump, which transfers heat between your house and the outside air. Ground-source / water-source or geothermal heat pumps achieve higher efficiencies by transferring heat between your house and the ground or nearby water source. Although they are more expensive to install they generally have lower operating costs because they can rely on more constant source temperatures. 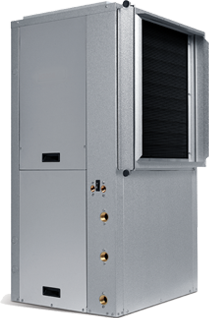 For more specific information on the types of heat pump that are available, read more here…. There are many benefits, both financial and environmental associated with heat pump installations which are the reason heat pump systems have become so popular particularly over the last decade. We have a wealth of information on the benefits of heat pump systems HERE. Some of the main reasons why people buy heating pumps are; they have high efficiency ratings, provide space and water heating and space cooling, they can substantially lower your energy bills, they can also significantly lower your carbon footprint and improve your property’s air quality. Read more here…. If you heat with electricity, a heat pump can trim the amount of electricity you use for heating by as much as 30% to 40%. High-efficiency pumps also dehumidify better than standard central air conditioners, resulting in less energy usage and more cooling comfort in summer months. However, the efficiency of most air-source heating pumps as a heat source drops dramatically at low temperatures. System efficiencies vary between installations and the parts used. Your property’s energy efficiency is also a hugely important factor to consider when calculating potential system efficiencies. Read more here…. Is a Heat Pump Suitable for my Property? They aren’t suitable for all properties but they are for most. There are a few things to consider for example, if you live in a low energy efficient, drafty property, then installing a heat pump without implementing other energy efficient measures such as fully insulating your property, your heat pump will struggle to be effective. Which type of system to go for, the proposed systems size, what technology it’s replacing are all important considerations. This section will help you decide whether a heat pump system is right for you. Read more here…. When a heat pump is correctly installed it should require very little maintenance and be expected to last for at least 20-30 years. The system will probably require an annual check which can be carried out by the systems owner or by a qualified engineer. If something does go wrong with your heat pump system it can lose efficiency fast but this underperformance will most likely be quite noticeable. It’s a good idea to do some research into which units have the most favourable maintenance requirements. Most Heating pumps come with a 5-10 year warranty on parts and labour as standard so anything less and start asking questions. Some also come with a free annual service but this depends on the manufacturer and installer. Read more here…. If you currently use oil, electricity, liquid gas or solid fuels to heat your home, an air or ground source heat pump may be a good way of reducing your carbon footprint and saving money on energy bills, especially when the Renewable Heat Incentive payments come into effect in 2014. Before purchasing a heat pump system make sure that your house is well insulated and that you have researched the proposed unit’s suitability to a large extent. Follow the link in the heading to find the vital information and guidance that we offer to prospective buyers. Read more here…. This section will tell you all about what certificates and accreditation to look out for when choosing your heat pump installer. We also use these pages to tie off any loose ends regarding issues to consider pre-purchase and pre-install. We provide a list of things to ask of yourself and your property, but primarily we list everything that you will need to ask your install company. This section should prove very helpful to prospective buyers of heat pump systems. More on this here…. At the bottom of the ‘Accreditation, Installers, and Manufacturers’ page we have a search box to help you find a heat pump installer that can service your area. Our database is the largest in the UK. Please remember to get at least three quotes from qualified and capable install companies before giving your project the green light. More on this here….